VRRT Team Oasis field report investigating cloud seeding contamination in desert borderlands. Changeist, like similar firms in our field, work on a lot of projects that — due to confidentiality — can’t be shown publicly. Occasionally, however, we’re lucky to engage in a project we can talk about, and in which we stretch our skills in support of a cause with global impact. We’re pleased to give some insight below into one such recent project, for the International Federation of Red Cross and Red Crescent Societies (IFRC). Alongside a handful of designers, artists and futurists, Changeist was recently selected to provide a selection of speculative artefacts and media in support of the General Assembly of the Red Cross Red Crescent (RCRC) Movement, which brought together members of all National Societies of this venerable international relief organization for a week in Antalya, Turkey in early November. Among its many functions, these Statutory Meetings gave the IFRC Innovation and Futures/Foresight team an opportunity to provide an insight into what the future needs of citizens might be. The team’s goal was to engage the senior leadership of the Movement, as well as the integral youth delegation, as part of the global RCRC body, to consider how emerging and entrenched trends and driving forces might impact society, humanitarian needs and the organization, its mission, and its ability to deliver on this mission in the coming decades. The desire of the IFRC team was to both inform and deliver emotional impact — making “real” future possibilities as a provocation to drive deeper consideration and action on the future, now. Alongside its previous What Futures project, these artefacts and experiences were exhibited for over a thousand delegates. In parallel with other futurists and designers, including Superflux and The Situation Lab, led by Dr. Stuart Candy, the Changeist team immersed ourselves in an array of trends and drivers put together by IFRC Innovation and Futures/Foresight, to develop a handful of mini-scenarios within which we could imagine and materialize physical fragments. Our goal wasn’t to develop full-blown scenarios as much as tie together several interesting threads and describe vignettes suggesting a complex world of 2030. This was a world in which the IFRC and similar organizations would face interconnected and complex challenges, including climate change, multipolar conflicts, grassroots technologies, and other discontinuities. Within these vignettes, we imagined a confluence of situations, tools, actors and bureaucracies — and detailed scenarios and artefacts which represented these in a way that mixes the familiar with the uncanny. The results, described below, represent objects and narratives that may not feel like a radical departure from the present, but which depict a shift in power from who are traditionally considered as main humanitarian actors. We felt this was a strong common thread running through the drivers and trends suggested by IFRC. They also speak to three big themes that resonated with us, and which are under threat from various global forces: Protection (as examined in through “Temporary Dynamic E-Citizenship”), Consensus (which we look at through “Reality Collection”), and Participation (which we take on through “Haches Vertes”) Our prototypes aren’t “solutions,” or proposals for working systems, but provocations meant to spark consideration of these issues as played out in co-existing “small worlds”. We hugely enjoyed our collaboration with the IFRC Innovation and Futures/Foresight team. The project provided both creative freedom and a challenging pace, as well as allowing us to play more deeply in the prototyping process. With patience and applied design from collaborator Sjef van Gaalen of Structure & Narrative, we sketched basic concepts, sourced materials from the four countries we worked in over the month the project was realized, and brought together a series of stories, objects, posters, documents, equipment, uniforms and video field reports for exhibition in Antalya. Within the creative process, we all enjoyed detailing the mundane elements that make these provocations feel more real. These are illustrated through things like the ephemera of operational instruction forms and logs from central dispatch, decade-old tracking code schema that won’t die, the juddering aesthetics of activist media, the environmental distress on field tools, or the shadows of private organizations injected into the global supply chains of relief logistics. Most of all, we were pleased to help IFRC Innovation and Futures/Foresight make an impressive impact within their organization, and to have the opportunity to play a role in pushing collective imagination and anticipation as the IFRC, collectively and as National Societies, face a challenging decade ahead. The energy of the assembled participants and those abroad who contributed — evident even when viewed from a distance — was encouraging to witness. Due to a steady increase in climate-driven disruption — intense storm seasons and flooding of densely populated coastal areas in Asia, drought-intensified conflict in the Mediterranean, Maghreb and southern Africa, and fires in South America — hundreds of thousands of people are left homeless and unable to remain in place. In 2026 alone, upwards of 35 million people were displaced, and needed assistance. A new system was designed to deliver legal protection and aid to the displaced and stranded, to hold off the unprecedented scale of emerging crises, and to deal with the massive assistance and resettlement demands that emerged. At a series of international summits convened by UNHCR in 2027, a framework for DyNaMo (Dynamic National Mobility) was agreed upon by twenty three countries, for implementation to begin in 2029. The DyNaMo system was built on the successful, long-term e-citizen programmes developed by Estonia, and a handful of other nations in the 2010s, which allow qualified individuals to gain digital-legal “citizenship” — though not rights to physical residency — in another country. The twenty three countries of the DyNaMo partnership agreed to extend between 1,000 and 10,000 temporary legal “citizenships,” as a means of expanding their own legal and social support systems for up to 120 days, for refugees remaining in their own country, or temporarily resettled in a third nation. DyNaMo was designed to protect those who are under meaningful threat from war, genocide, non-voluntary resettlement due to a natural disaster, or other significant cause. Instruction card for IV&R kit operator. Similar to the way Internet addresses or prepaid mobile numbers are assigned and revoked, the temporary citizenships are drawn from a pool managed by the IFRC and other cooperating international groups, and assigned in the field by trained relief workers. Temporary “citizenships” are extended solely for the purpose of protecting populations by enabling delivery of financial, medical or other critical assistance that is not available locally, which could only be supplied under cover of an appropriate social safety net or legal protection framework of a third country. DyNaMo citizenships were designed to expire and be returned to the pool in 120 days, or earlier, as deemed by the issuing country or relief body. Protection and benefits are only delivered in the field and are not useable for actual resettlement in the issuing country, though they do provide a special category of humanitarian consideration should the recipient wish to apply for resettlement through normal channels at a later date. 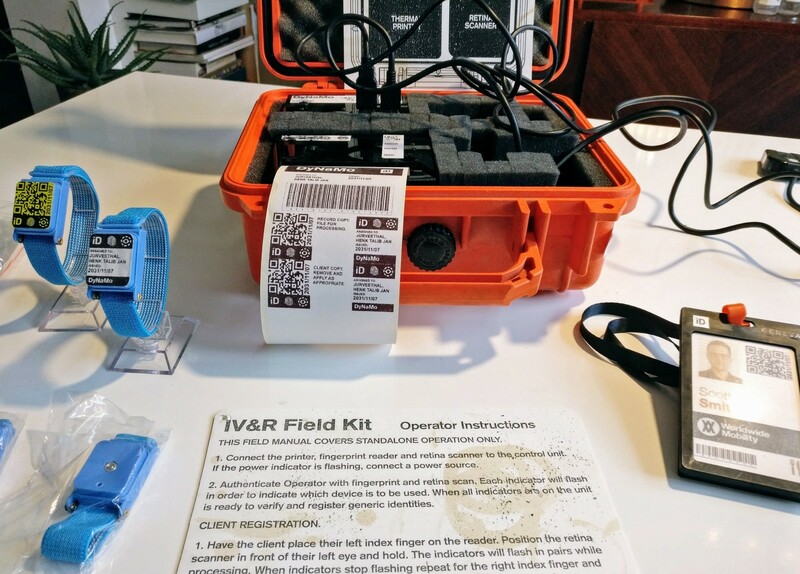 In the field, a simple kit, comprised of a biometric registration system, a single use bracelet holding identity and citizenship information, plus a payment chip for storage of funds, can be deployed, remotely activated/deactivated to prevent theft , and carried from location to location by approved DyNaMo officers. Teams from an international logistics contractor — Worldwide Mobility — is used to deliver a mix of first response services in the field, and provide follow-up. Digital receipts for temporary citizenship bracelet. 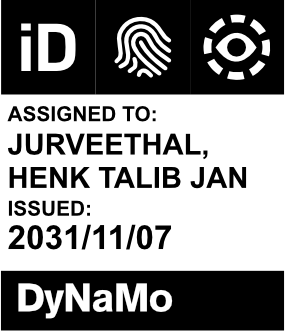 DyNaMo is designed to provide tailored levels of protection and relief that are situation- or location-specific for populations in crisis, and allows issuing countries to better control emergency migration by supporting aid delivery scenarios without the need to resettle refugees within their own borders. The so-called fake news phenomenon of the late 2010s only built more momentum into the early 2020s as the power of international governance bodies and traditional media were further eroded through increased distrust and weakening political alliances. The roles of international observers and documentarians alike were increasingly questioned, restricted, or not supported, as fringe groups sowed distrust in media, legal and scientific frameworks. As a result, so-called “facts on the ground” became far harder to substantiate in both large and small crises by the mid-2020s. Whether a natural or manmade disaster, climate disruption, forced migration or health crisis, the fundamental role of objective information and knowledge as the basis for mobilizing relief and support efforts was dramatically undermined. How many people were affected? Over how large of an area? What were the causes? What was the situation at a local level? All of these basic questions became increasingly difficult to answer. IBER field kit prepped for deployment. In response, blockchain technology — which was designed to establish indisputable records of transactions for financial and legal applications — provided a potential solution. 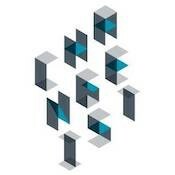 Proposed as an open legal project by several international bodies in 2023, and supported by the International Standards Organization (ISO), the International Blockchain Evidence Registry (IBER) was agreed to by treaty and initiated in early 2027. 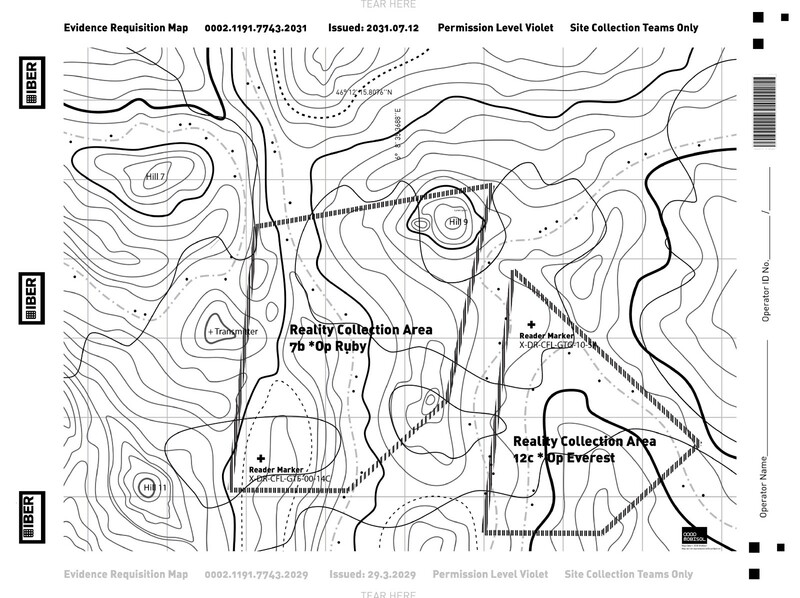 IBER reality collection survey map. IBER consists of a set of standardized, audited recording and collection tools, such as cameras, LiDAR technology, and sensors tied to the Internet of Things. 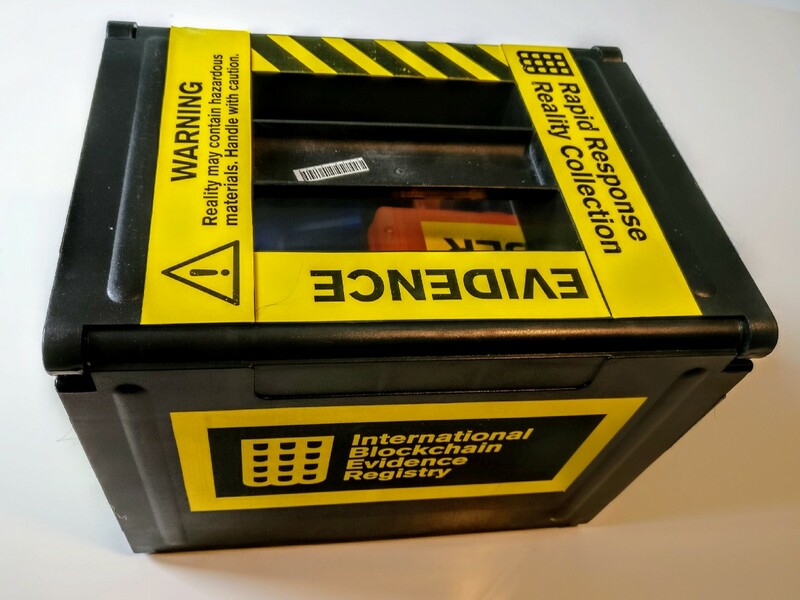 These kits enable teams of special ground observers to visit areas impacted by war, dispute, disease outbreak, sudden mass migration, or natural disaster, to record critical information for a centralized blockchain registry, which, by legal framework, cannot be repudiated by signatories. 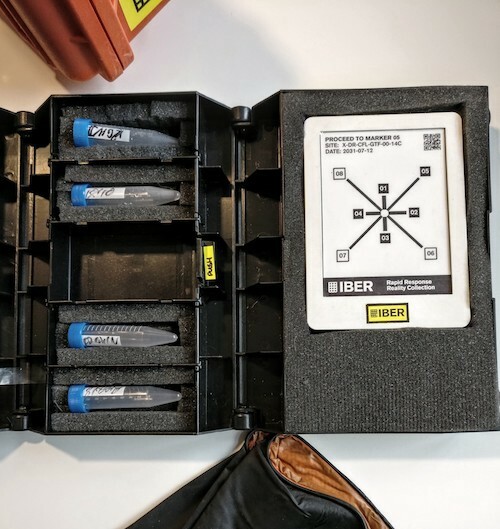 IBER LiDAR directional manager and forensic collection vials. IBER had its first real-world test after a disputed attack on civilians in 2028. Following reports from observer groups, national authorities initially refused international assistance. After contentious negotiations, IBER kits were deployed by specially trained teams, to collect, log and track changes in critical environmental and population health information, enabling relief to be delivered quickly and adequately by Red Cross/Red Crescent teams with full international support. IBER was subsequently used in international courts to determine criminal responsibility for the incident. By the mid-2020s, an increasing tempo of unanticipated crises — particularly environmental and technologically driven infrastructure failures — push the ability of traditional international groups to respond. Additionally, national organizations focus more and more on domestic issues, and the Global North recedes from assisting with issues in the Global South. Item of VRRT field wear, customizable by operational unit. At the same time, resources and skills are increasingly available and accessible in emerging economies. A mix of indigenous and transnational organizations stand up in these countries, with the aim of providing crisis management, mitigation, and assistance, as climate change impacts more harshly on these populations. One such organization is the Haches Vertes, the Green Hatchets, or Green Axe. Referred to in sub-Saharan francophone countries as ‘Les Vertes’, they are commonly known in the anglosphere as ‘Virts’. Thus, the acronym most commonly seen on the uniform vests they wear when deployed: Volunteer Response & Resilience Team, or VRRT. The Virts are a volunteer, swarm-based aid group with roots literally and figuratively in the Saharan Green-belt initiative. Founded by a mixture of radical permaculture designers and military veterans from both combat and expeditionary reforestation units, their mission was initially to defend community projects in the region. The group differentiates itself from traditional aid groups such as the Red Cross/Red Crescent, or activist groups such as Greenpeace, through its multi-decade strategic planning approach and focus on action. Beyond traditional disaster relief, areas visited by the Virts are appointed special advisors for strategic resilience training and for the management of work programs, most commonly involving water infrastructure and reforestation efforts. Haches Vertes global appeal from field activists. VRRT Team Philonesia field report on DIY incubator repair. Disillusioned with global governance breakdown, a steady influx of volunteers from the western world have bolstered the ranks. Volunteers are provided a cryptocurrency stipend, and there is great aesthetic appeal in the performative aspects of the work. Recruitment centers on guerrilla media which documents situations and interventions where Virts are first on the scene to collect information, document incidents and deliver medical, technical and strategic assistance. UPDATE: You can read more about the IFRC’s project at Fast Company, and see the exhibition site at IFRC. Thanks to the IFRC Innovation and Futures/Foresight team — Shaun Hazeldine, Aarathi Krishnan, Carlos Alvarez and colleagues — for their interest and support in development of these artefacts. Also to Susan Cox-Smith, producer of the project for Changeist, and Madeline Ashby, for ideas and feedback on particular concepts, and Ossie Mashiyi-Veikkola, Elisabet Roselló and Joy Blundell for their contributions to the activist videos. For more about what we do, see changeist.com, or follow us on Twitter @changeist or Instagram.